Mette Kvam, 81, has lived alone in her mountainside home ever since her husband died. Life can get a little lonely. 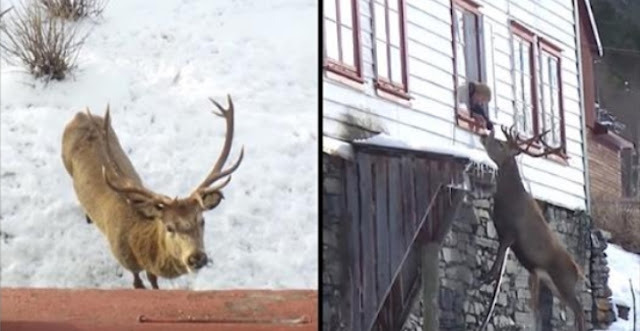 But four years ago, a hungry stag wandered into Mette’s yard in Aurland, Norway. Mette was instantly taken by the giant deer’s sweet and gentle demeanor. She quickly learned how much he loved to snack on bits of bread. She named him Flippen, and sure enough, he returned to stand underneath Mette’s window the following day. Since that first fateful encounter, he has visited twice a day every day. The adorable scene below was caught on camera by a woman named Britt, who spotted Mette and Flippen together while she was walking through the mountains. The kindhearted widow loves nothing more than to feed and visit with her good pal. Over the years, the two have formed an incredible bond. To get to his human friend, the wild stag has to stand on his hind legs and reach up to her window, but he does not seem to mind at all. There, he can always count on a special treat, kind words, and some pets for a good measure. Doesn’t it all look rather like a scene from a Disney movie instead of real life? Responses to "Wild Stag Visits Lonely Old Woman's House Every Day"